May 14, 2008 — In my head, as near as I can describe it, is a pantheon. It's embarrassingly white and embarrassingly Greek. At some point, I plan on renovating it to look more like it should: a study with leather reading chairs, floor-to-ceiling bookcases, and an un-drainable decanter of vintage port. But the point is what’s inside the place. This pantheon is filled with the imagos of writers, musicians, painters, philosophers, and there might...might, I tell you...be one or two day-time talk show hosts. They are the men, women, and children whose works have altered me on the most basic sub-atomic level. In fact, I said “filled” earlier, but a more accurate description is “sparsely populated.” But I did mean “imagos.” These artists aren’t represented in my head by statues, like in a hall of heroes, nor are they ghosts haunting its dark recesses and hallways (although that would be way cooler). They’re more like half-bored train platform commuters milling around the area, some of them involved in half-hearted conversation, but most just lounging idly, as if they were awaiting some event that I have no clue about. Probably my death. But prominent in the writer’s section of my head-pantheon is Clive Staples Lewis. C.S. Lewis's ideas are reasonable. They often hurt. They’re hopeful in humble ways. They explain the vagaries of human nature. They’ve got a sense of wonder. They have paradoxes. From the amount of time I’ve had to think about such matters during commercial breaks, I’ve come to realize that the most accurate ideas about the universe must have all these. Lewis’ elaborations on the subjects in his works are poignant, compelling, and worthy of legacy. And, boy, does he have one...for children’s books. Ha. I got your paradox. Lewis’s life was completely Oxford, but all those bits of environment and influence and genetics that Voltron together to form who we are congealed for him in Belfast, Northern Ireland, where he was born and spent the first decade and a half or so of his life. Once I knew I was Ireland-bound, I figured that there had to be something C.S. Lewish there for me to see. 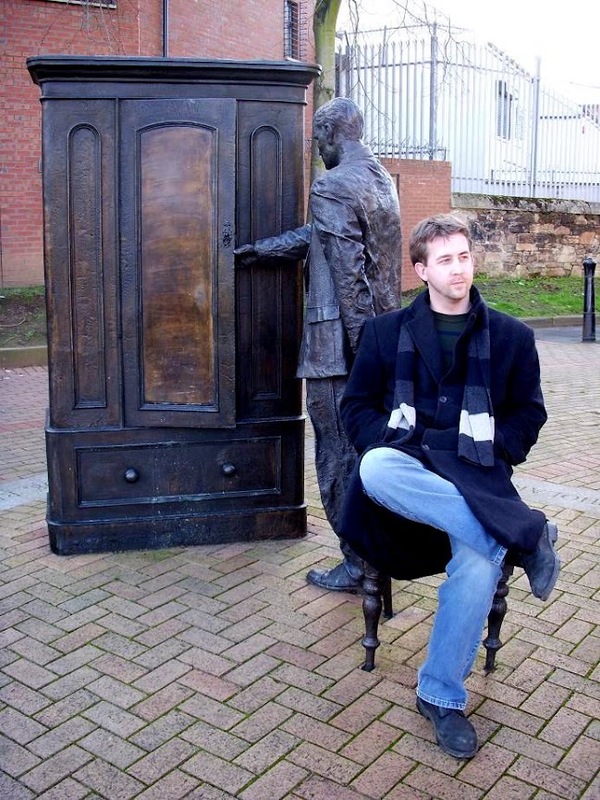 Turns out it’s a large bronze wardrobe with a bronze man opening it while resting a bronze hand on a rather inviting bronze chair in front of the Holywood Arches Library near downtown Belfast. Mostly it’s called the C.S. Lewis Centenary statue, since it was erected on the centenary of his birth and because his name is C.S. 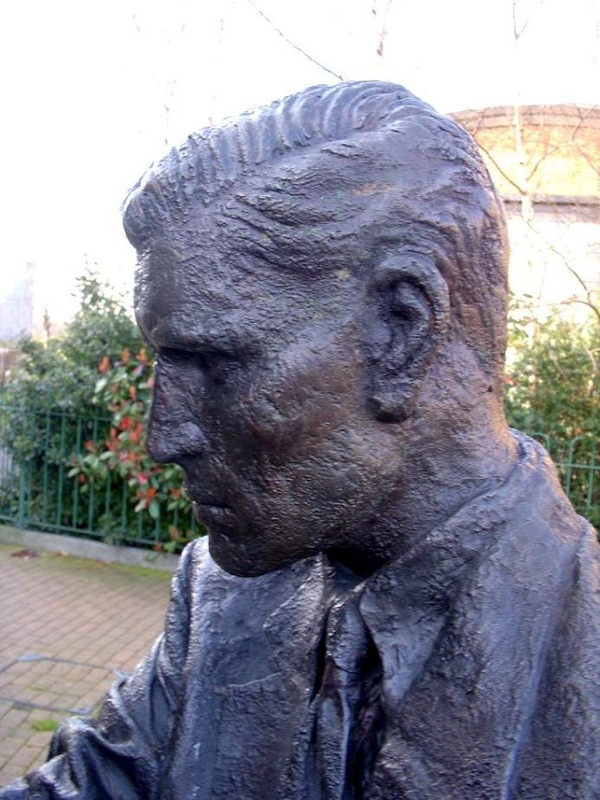 Lewis, but the statue itself is really called “The Searcher Centenary Statue." In fact, while most sculptures that I’ve seen seem to try hard to be both obtuse and enigmatic, this Lewis statue is loquacious. First, a square cement border on the pavement takes care, more or less, of all the factual information that one usual gets with a statue dedicated to someone famous. One side of the square gives the name of the statue. Another gives his name as “C.S. ‘Jack’ Lewis – Ulsterman." A third side offers both the date of his birth and the date of his acceptance of Christianity. And the last side predicate nominatives him (writer, scholar, teacher, Christian). 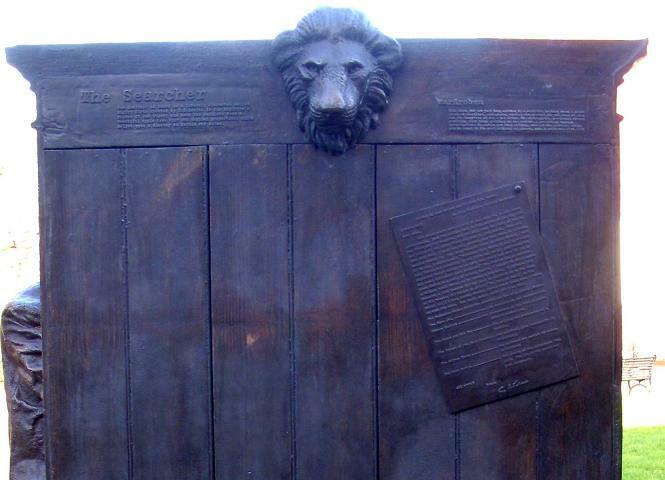 Off-center below the lion’s head is reproduced in bronze a letter from Lewis to a little girl who had written to him asking him to explain his Narnia stories. 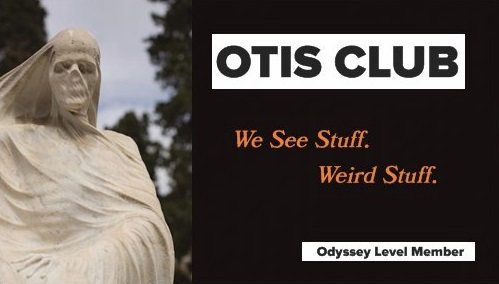 Just as the statue takes pains to explain itself, Lewis’ reply is surprisingly specific as he outlines the religious themes of each of the books. Anyway, now that I've transcribed most of the statue, overall, I think it's an extremely fitting tribute to C.S. Lewis. I might now have to install a wardrobe in my head-pantheon for the man.